With its Belt and Road Initiative, China is regarded as connector, shaper, investor and challenger in Central and Eastern Europe. Connector: The Great Wall of China is a longstanding symbol of China’s historic isolationism, but today Beijing steps forward as a major proponent of globalization and flagbearer for international connectivity. This narrative attracts many stakeholders in the CEE region, and the desire to enjoy greater affinity with the global market is a relevant driver behind enhanced China-CEE political relations. In approaching relations with China, Central European analysis usually focuses on the positive economic aspects of cooperation. Worrying side-effects contained within these benefits are often ignored. Yet it is worth remembering that Beijing invests in the region on its own terms, supporting only those projects deemed strategic, including steel mills, chemical companies, highways and high-speed railways. China does not need the CEE area to act as a much-mooted “gateway to Europe.” China is already firmly anchored on the continent through trade and investments in the European Union’s big four of Germany, France, Italy and the United Kingdom. Paradoxically, Beijing may actually serve to re-connect Central and Eastern Europe with the core of the EU as it forces Brussels to pay close attention to Chinese actions in the region. Shaper: China’s proactive attitude has gathered the countries of Central and Eastern Europe around the promise of mutual economic gain. The 16+1 format has developed into a loosely administered club with regular high level meetings, national coordinators and a joint secretariat. As the CEE-China platform enters its sixth year, there is more understanding among all parties regarding the context of the cooperation. However, China finds it is difficult to curb a tendency to approach the region, exceptionally heterogeneous in nature, as a single bloc. The region’s initial enthusiasm has been replaced with a more cautious stance. In retrospect, China missed an opportunity to establish a common 16+1 denominator – a goal around which all the countries would unite. China-sponsored big-ticket infrastructure investments have failed to maintain momentum for CEE-Beijing cooperation. As a result, differing opinions have emerged in Central and Eastern Europe on China and its engagement in the region. Hungary and Serbia, the most receptive to capital arriving from Beijing, could be counted among China’s greatest protagonists. Most other CEE governments express a rather neutral stance in regards to the Chinese blueprint, attaching minor relevance to the BRI initiative for their countries. Chinese authorities’ vision of cooperation with the CEE region is pragmatic, but so far implementation has been weak. Promises of massive investments often do not materialize, including plans for nuclear and coal projects between China and Romania from 2013, and numerous grandiose declarations devoid of real impact inject increasing fatigue into the project. 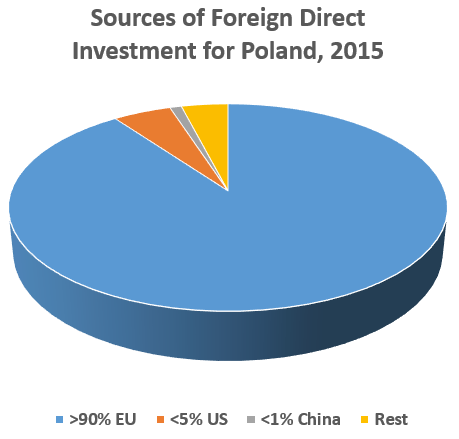 Investor: Approximately 10 percent of China’s European investments are in the CEE region. Meanwhile, the region itself receives around 90 percent of its investment from the European Union and the United States. China clearly does not consider the region a major investment priority, and the feeling is mutual. Nevertheless, Beijing’s presence in the region is significant with millions of dollars poured into infrastructure projects, as well as the industrial, service and entertainment sectors. In recent years Chinese CEE investments have followed a similar pattern – concentrating on fusions and strategic acquisitions while leaving greenfield projects aside. A BRI requirement is that projects should be fully, or at least substantially, executed by Chinese companies and that a local government should guarantee the loan. This approach promotes not only Chinese capital, but also the nation’s technologies and workforce. With such a model, China increasingly looks more like a lender than an investor. Easy access to Chinese money could be particularly risky for smaller 16+1 players, where uncontrolled growth of debt could pose threats to the fiscal stability of their economies. When Montenegro signed a highway contract with China in 2014, it saw its public debt grew by 23 percent. Similar concern about debt burden has led many in Pakistan question China’s massive Belt and Road projects in the country worth more than $50 billion. The lack of reciprocity in Europe’s investment relationship with China is attracting attention in Europe as well. Whereas Chinese foreign direct investment inflows rise rapidly, the amount of money flowing the other way has stagnated. The asymmetry in investment and trade causes serious concerns in Brussels, but also in other European capitals. Challenger: As the Chinese economic footprint in Europe expands, so too does the interest paid by Brussels to China’s activities. The Asian superpower – from the perspective of Paris, Brussels or Berlin – is increasingly seen as an economic and political challenger in Central and Eastern Europe and on a wider global scale. After a series of high-profile acquisitions in 2016 and 2017, including those of the Swiss chemical company Syngenta and the German robotics group KUKA, officials in Europe were near a state of panic. In September 2017, the European Commission’s President Jean-Claude Juncker proposed a screening framework to avoid future foreign takeovers in sensitive sectors. Germany has already tightened its rules on corporate acquisitions, and another 11 EU countries are exploring changes to their national regulations. Alongside concerns stemming from China’s activities in Western Europe, Beijing’s increased engagement in the CEE region is also regarded as a potential threat to the European Union. German Foreign Minister Sigmar Gabriel said recently that if Europe does not succeed in developing a single strategy towards China, then China will successfully divide the continent. Warning signs were visible in 2016, when Hungary and Greece – major recipients of the Chinese capital – blocked a strong EU Council declaration on Beijing’s operations in the South China Sea. Many European officials suspect that Chinese infrastructure projects in Central and Eastern Europe might come with a political price attached. Some countries, seeking not only investments but also alternative political affiliations, are more than willing to play ball. Beijing’s financial firepower, including tens of billions of dollars in credit lines and the full engagement of mammoth state-owned enterprises, is unprecedented in its scale. It should be remembered in Central and Eastern Europe that China has grown into a promoter of globalization not only out of goodwill but due to its own national interests. And that same pragmatic approach should be adopted by the CEE region and more broadly within the European Union. *Michał Romanowski is an expert in Eurasian affairs at the German Marshall Fund of the United States.